As someone deeply dedicated to holistic healing modalities and a great believer in nature over “big pharma” I love stories of people being helped or healed by all-natural remedies, you can read my won one here. Sometimes healing occurs on more of an emotional or energetic plane, but when this type of healing brings a person back from a massive physical injury – that is when the power of holistic healing really turns heads. Don’t get me wrong, both types of healing are important, and I would even argue that sometimes emotional healing is more significant as it leads to more speedy physical recovery, but we are just so wired that our mind pays attention to more “wow” type of stuff. So when I heard the story of Carlos Alvarado, I knew I had to share it. Carlos was born in northern Bay Area but lived most of his conscious life in Texas, moving to San Antonio at the age of 7, and later to Houston. Now 23 years old, he has what he calls a “complex” family structure, where his mom and stepfather each have children from multiple marriages so Carlos has more siblings than he can count on one hand, all of them with different degrees of relationship to him. But, as Carlos puts it, he “would take a bullet for any of them” regardless of whether they are related by blood or not. He also has a daughter, Khaleesi, who is 1.5 years old. At the moment, Carlos sells health insurance for a living, but he finds the job to be utterly heartbreaking. “It involves a lot of travel, they keep sending me to these places… I went to West Virginia recently and it is ravaged by drugs. Same in Arkansas. I am on the front line of health insurance, and it breaks my heart to have single mothers or single fathers call about getting a family plan, often even one supported by their employer, and they cannot afford it. It can be upward of $400 a month. And if they don’t get it they get penalized during tax season. So it’s merely a decision between spending the money now or spending it later. Breaks my heart”. Carlos really got a chance to put his challenging relationship with conventional medicine to the test a few years ago, when his normal life came to a screeching halt because of a motorcycle accident. “I grew this random obsession with motorcycles. It was a wild time, you know. I was young, I wanted to be like the “boys”, and one of my friends got a street legal dirt bike. So I really wanted one too! I though it would be so cool to ride around together. I joined the military earlier, and just came back from my first deployment, got a fat check and decided to spend it all on a bike”. Carlos got himself a Yamaha XT250 and a feeling of the coolest guy on the block. He enjoyed his new purchase for about three months before one fateful day, when he was riding home and tried to make a light – only to T-bone a large SUV that decided to edge out into the intersection. “I flew about 30 feet forward… I scraped my head, not sure how I didn’t just bash it in. I was very disoriented, started asking the people in the SUV if they were okay”. In reality, Carlos himself was the one he needed to be worried about. When he was taken to the hospital, an X-ray discovered that his pelvis was broken in half, with surrounding organs severely damaged. He had many scrapes all over his face and chest, as well as a deep gash in his foot. “Getting to the hospital was kind of a blur. I just remember waking up in this really bright room, now I know it was ICU, and people trying to cut my clothes and telling me to go to sleep. I think they were putting a lot of drugs into me”. Carlos stayed in the hospital for 3 weeks, but it was only the beginning of his troubles. His parents’ house wasn’t good for his recovery as bathrooms and showers were upstairs, so he stayed for the next 3 months with his girlfriend’s parents. He was immobilized. “It was a really dark time. I couldn’t move much, or do anything, everyone had to take care of me. I had to go to army stuff and I was in a wheelchair. I was such a hassle for everyone. At a certain point, you just run out of things to do. How many more videogames can you play? How many more movies can you watch? “ After about three months Carlos decided to begin his own rehabilitation efforts. “I didn’t really have transport to go to the hospital for physical therapy twice a week, and I was also running out of money for co-pays. Conventional medicine just wasn’t doing it for me anymore”. With conventional medicine not really being an option anymore, Carlos started educating himself on things he could do himself to get better. In his research he came across yoga and decided to give it a try. “I bought a few DVDs and started doing the exercises, slowly at first and not all of them, but progressively getting better. Little by little I got myself back to walking. The doctors said I was never going to be able to walk so soon, but I did. When I got good enough to go places, I wanted to go to a studio. I wasn’t into the spiritual stuff just wanted to do the exercises for my body”. 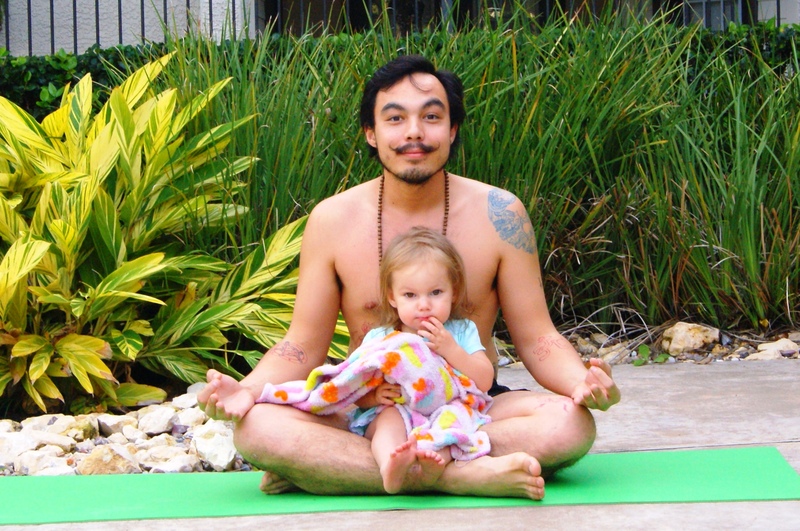 After a recommendation from a friend, in December 2015 Carlos went to Houston Yoga & Ayurveda in Cypress. A quaint studio situated in a house among trees, with an herb garden and free range chickens in the back – the place provided both physical and emotional healing for Carlos. “I started going there and something just clicked – I needed to take yoga teacher training”. Carlos is now 3 class-shadowing sessions away from his certification. “My life perception is completely different now. I am better at staying in the moment. I realized that things I learned are the things I want to teach. I see suffering in people and it is the same one as I see in me. So what helped me – I want to share it with them”. When I asked Carlos what love means to him and what role it played in his recovery, he got quiet for a long time. Like, he didn’t speak for at least five minutes. “Love for me is Namaste – the light in me honors the light in you. I am not trying to take my love away from anyone by saying that I love everyone equally – I am just saying I have enough love for everyone. I try to live by the golden Rule and treat everyone the way I’d like to be treated. Love everyone the way I’d like to be loved”. And what about his recovery? “Body heals but it takes heart to do that, it takes love to do that. Now that I’ve engaged in the spiritual part of yoga and expanded my understanding of love – I am finally feeling healed. I am being healed”. As Carlos and I were saying goodbye, I was thinking how much I wished that all people who are recovering from injuries, be they physical or emotional, could serendipitously be guided to natural healing through yoga, herbs, and essential oils. But while serendipity is making its winding way, we will do our best to spread the word. Namaste.